Look at this creative team. They join a legacy of giants, and no doubt in a few years, we’ll look back and consider them giants, too. 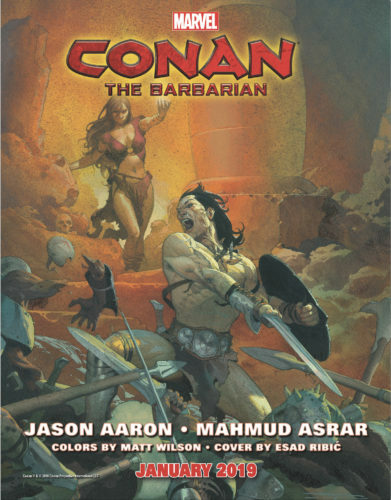 Because writer Jason Aaron has done some moving, thoughtful, and occasionally ultra-violent work with Thor, it stands to reason he’ll bring some depth to Conan the Barbarian. Mahmud Asrar’s layouts pulse with energy, and on the covers — Esad Ribic hearkens back to the glory days of the pulps. If you’re going to bring the Cimmerian back to where he started in comics, this is a good way to welcome him.